How big is baby? The size of a Sweet Potato! 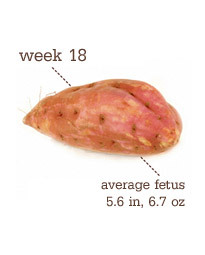 Baby Development FYI: He’s about 5.6 inches long and about 6.7 ounces now and he keeps on growing rapidly. (That’s why you’re probably feeling so hungry.) Can you believe she’s yawning, hiccuping, sucking and swallowing? And he’s twisting, rolling, punching and kicking, too — and he’s big enough that you might be able to feel her doing it! My body has been invaded, how’s that going? Bump is still growing (duh) and from what I’ve read, it should really take off in the next few weeks. Sleep has not been an issue aside from getting up to use the bathroom. So I consider us lucky. (I say us because when Nate was asked how he was doing he replied “I’m good if she’s good!”) I’ve been trying to lie on my side, even when on the couch. Nothing “new” in the symptom department, but I’m guessing I just jinxed it by typing that. So all hell is going to break loose tomorrow. What’s been on my mind? I realized this week, to people who know me and know that I’m pregnant, I look pregnant. But when around people who don’t know me, I just look fat haha. We hung out with some people from Nate’s work the other night and it was funny to see their faces once someone asked me how I was feeling. A few of them sighed and said “Ohhhh good, you are pregnant! We were wondering :)” Some women may have felt awkward after that, but I thought it was hilarious. Especially if we’d left without ever clearing the air, just imagining the speculation made me giggle. Crazy Cravings: Hamburgers. Lemonade. Pickles. FINALLY back to my beloved pickles! Has anyone else literally salivated when standing in front of the pickle section? I went to the store Tuesday night and set all the food out on the counter before putting away. Nate got home and looked at it all and said “Oh wow. Did a pregnant girl go shopping?” 3 jars of pickles, salsa, hot sauce, apple juice, chips, honey. Definitely ate a whole jar of Claussen’s sandwich slices…sorry boo. I felt the first flutters on Tuesday…during a meeting at work. Needless to say, it was hard to pay attention to everyone for a good 5 minutes. LOVE the feeling. It feels like there is a tiny bubble machine blowing light, tiny bubbles at one time. At one point it felt like something was lightly flicking the inside of my uterus too. That was cool. I asked Nate if he was a little jealous that I could feel the baby moving and kicking. He said “NO! Why would I want something kicking my insides? !” So add 1 point to women are a little nuts. Then Sunday night, I felt the kicks! So awesome, it felt like Christmas morning. Right now the kicks are cute, but they will probably become not so cute once the baby gets bigger and stronger. I’m glad to know the baby is growing strong and doing alright in there! The anatomy scan on Wednesday. It is always great to see an ultrasound of the little one. It was moving around, waving it’s arm, and rolling around (I knew I was feeling that!). But when you have an extremely full bladder that the nurse and receptionist refuse to let you empty, and someone is mashing on it for 30 minutes…what kind of mood would you be in? To make matters worse, when I could finally use the restroom, the nurse insisted on pointing out ALL the features of EVERY ultrasound picture print out. I was really trying to care, but I didn’t, I was about to pee on their floor. While listening to “see this foot print, that is a foot. See those 2 dots, those are the eyes and the head around it.” I hear someone go into the one bathroom for some weird test that was going to take a while. I about cried. And about slapped the nurse and receptionist. I think they stuttered a bit when they asked me if I could make it to the next floor without wetting myself. Obviously I’m venting just a bit about Wednesday and I think Nate will remember more about me being pissed about my bladder than the anatomy scan haha! 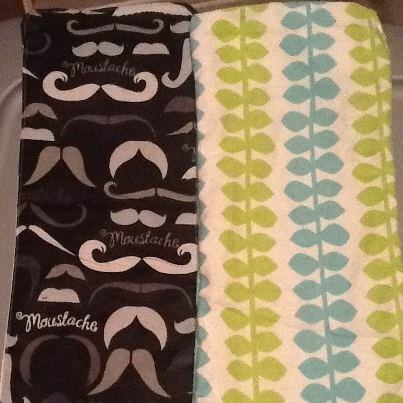 Nate and I made burp cloths…can’t have too many! What an exciting time for you!! I remember the kicks. And you're right, after a while they do become more uncomfortable. I loved being pregnant the first time. Wait until baby starts hiccuping when they're bigger and you can feel it and you keep trying to get your hubby to feel it! Thanks for stopping by my blog. I'm following you now! He has only felt it once still. But I'm so glad there is something that he will be more a part of now. Hoping to have a kicking fit tonight so he can feel a few more! Looking good girl! Get ready to start putting on a few pounds, and the hunger just will not let up! I literally stuffed my face while in Hawaii because I was starving ALL the time! This hunger is insane. And thought the hunger at week 4 was bad. Now that's just funny!See, that's what I need, to go to Hawaii and stuff my face. I think I'd feel a lot better! you look fabulous! congrats congrats!! and good luck.i am your newest follower. Burgers and pizza! That is what I am craving! You are looking great!! I am 18 weeks along myself with the second babe! So glad you found me! 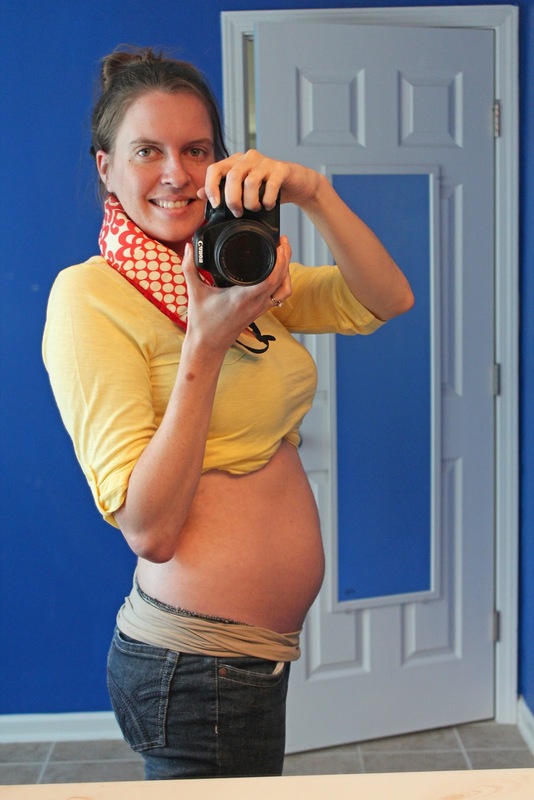 I have been trying to find other pregnant mom bloggers on MBC. Your bump is SO CUTE! I'm way jealous. Mine still hasn't “popped out” yet. Can't wait to read more! Same here! Today all the sudden, I came across 5-6 which made my day. Love reading all the updates. All so similar yet SO different! What a cute little tummy you're getting. Enjoy the pickles, Krista, and that sweet baby.